Vote for this year’s Social Finance Innovator Award! At SocialFinance.ca and the MaRS Centre for Impact Investing, we are dedicated to building the social finance marketplace and ultimately shifting the existing financial system. The transformative potential of social finance is deeply rooted in its ability to mobilize the resources of traditionally fragmented sectors towards a common vision of social or environmental good. In early fall we opened up a public nomination period, from which we are pleased to announce the seven finalists for this year’s award. Now it is your turn to speak up and vote for the social finance deal that you feel deserves the title of “Moving Money that Matters” and winner of this year’s award. AltaGas and Indian Business Corporation: A first-of-its-kind investment of $500,000 by AtlaGlas into Indian Business Corporation will make capital accessible to Aboriginal entrepreneurs in Alberta. Freycinet Investments and Proteyocyte Diagnostics: Freycinet Investments, an investment firm that supports high-potential, knowledge-based seed and early-stage entrepreneurs, recently invested in Proteocyte Diagnostics’ preventative health technology. Lina Bowden and the Social Innovation Shared Space in London: Local London, Ontario investor and social finance champion, Lina Bowden, is catalyzing capital for a Social Innovation Shared Space that aims to fuel transformational change in the city. MEDA and Mountain Lion Agriculture: MEDA, a Canadian international economic development organization whose mission is to create business solutions to poverty, is promoting food security through a convertible debt investment in Mountain Lion Agriculture. Tides Canada and the Kuterra Project: Tides Canada’s Salmon Aquaculture Innovation Fund helps develop alternative models to traditional open-net aquaculture in B.C. Its investment in the ‘Namgis First Nation’s Kuterra project, is the cornerstone of the fund’s work. Solar Share Co-operative Bond Holders: SolarShare, a non-profit co-operative, enables investors big and small to invest in the world they want through Solar Bonds. Make your choice for the 2014 Social Finance Award before November 6 at 11:59 p.m. EST by voting here! 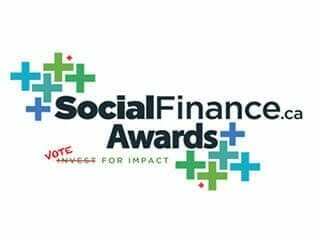 The winner of the Social Finance Awards will be announced November 7, 2014 at this year’s Social Finance Forum, the place to engage leaders and practitioners in the diverse social finance scene. If you don’t have your tickets yet for the Forum, buy them before its too late! Announcing the winners of the 2013 Social Finance Awards!